Bill Gates has rightly said “If you born poor, it is not your mistake but if you die poor it is your mistake.” Considering fact above everyone wish today to become rich. People try various options to become rich including stock market investment but very few succeed in stock market by earning good return because they fail to sense opportunity to purchase right stock at right time. A right stock means stock that can provide you good future return and right time means time where stock is available at lower valuation. We are herewith 10 ever green stocks that can make you rich. Sun Pharmaceutical Industries Limited is an Indian global pharmaceutical company headquartered in Mumbai, Maharashtra. This company manufactures and sells pharmaceutical formulations primarily in India and the United States. This company was established in 1983. Lupin Limited is a international pharmaceutical company based in Mumbai. Lupin was founded in 1968. It is the 2nd largest Indian pharma company by market capitalization. 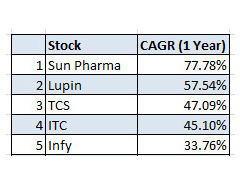 Lupin seems to be fastest growing pharmaceutical company in US and Japan Market. Tata Consultancy Services Limited (TCS) is an Indian multinational information technology (IT) services, business solutions and consulting company based at Mumbai, Maharashtra. TCS is subsidiary company of Tata. ITC Limited or Indian Tobacco Company Limited is an Indo-British conglomerate headquartered in Kolkata. ITC is leader in Fast Moving Consumer Goods (FMCG), Hotels, Paperboards, Paper & Packaging and Agri Business. Infosys Limited is an Indian multinational deal in IT service provider, software engineering and outsourcing services. Infosys was founded in 1981 has headquarter in Bangalore, Karnataka. Infosys is the third-largest India-based IT services company by 2012 revenues. Bajaj Auto Limited is an Indian Vehical producing company founded in 1930. Bajaj Auto is the world’s third-largest manufacturer of motorcycles and the second-largest in India. Maruti Suzuki India Limited is an automobile manufacturer in India.It is a subsidiary of Japanese automobile and motorcycle manufacturer Suzuki. It share highest number of market share in car market in India. HDFC is an Indian financial services company based in Mumbai, Maharashtra that was incorporated in August 1994. HDFC Bank is the fifth largest bank in India by assets and the largest bank by market capitalization in 2012. L&T, is an Indian multinational conglomerate headquartered in Mumbai, India.The company has business interests in engineering, construction, manufacturing goods, information technology and financial services. L&T is India’s largest engineering and construction company. Axis Bank is headquartered in Mumbai, Maharashtra. It had begun operations in 1994, after the Government of India allowed new private banks to be established. This Bank was promoted jointly by Unit Trust of India, LIC, General insurance, National Insurance etc. 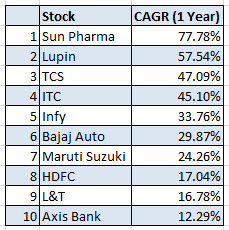 Do you think Investment in these stocks can make you rich? Please post your view in comment sanction. « How to Select Low Risk High Return Stocks in Equity Market?